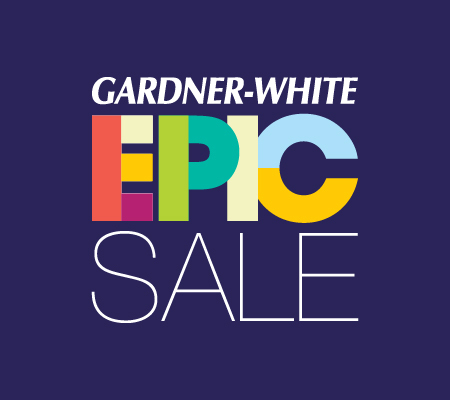 Since Gardner-White opened its doors in 1912, its mission has been unchanged – offering the best deals on great furniture at a wide variety of price points. 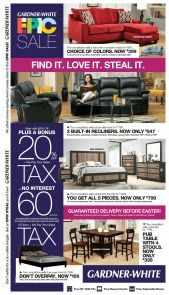 Gardner-White has the widest selection of furniture in Michigan with prices no other dealer can match. At every step, from sales to delivery, there is never any doubt at Gardner-White as to our #1 priority is – a satisfied customer! Gardner-White sales associates have the best product knowledge in the industry so that they can provide customers with the necessary information to make the best buying decisions and select furniture that fits within their lifestyle and budget. Our fast and easy furniture delivery is supported by a state-of-the-art distribution center, housing thousands of furniture pieces ready for same-day delivery. Additionally, Gardner-White customers can track their delivery using GPS technology – rather than waiting at home all day for delivery, or sitting by the phone waiting for a delivery guy to call, Gardner-White customers receive a 20-minute window during which their furniture will be delivered so they can go about their busy lives. Gardner-White first opened its doors in 1912 with a store on Mack Avenue in Detroit, later adding a store at the intersection of Fort Street and Junction. We began a period of expansion into the Detroit suburbs in the 1970’s and 1980’s, also opening a distribution center in Warren, Michigan to support this growth. Gardner-White operated out of this distribution center until 2012, when it built a 500,000 square foot state-of-the-art distribution center in Auburn Hills, Michigan. This larger footprint enabled us to expand the product selection offered to consumers. At the same time, Gardner-White continues to open new stores and expand our store size to continue expanding our product selection. Gardner-White is a team of innovators, and has been the first to do many things within the industry: We are the first in Michigan to offer same-day furniture delivery. We were the first in the industry to offer TV’s and other electronics with a furniture purchase. We were the first in the industry to offer removal of a customer’s old mattress when they purchased a new one. Gardner-White has also been family owned and operated. One thing that makes us unique in the furniture industry is the number of daughters who have followed their father’s footsteps and joined the Gardner-White team. It is part of Gardner-White’s DNA to support the metropolitan Detroit community that we have been a part of for more than 100 years. The company and our team develop partnerships with organizations with which we can make a big impact. For example, Gardner-White hosts quarterly blood drives in our stores in partnership with the American Red Cross. These blood drives are second in collections in the state only to the University of Michigan-Ohio State University blood battle, and have helped to save the life of more than 20,000 people. Gardner-White has also partnered with the Salvation Army in many ways, including picking up used furniture from our customers’ homes before delivery. The Salvation Army has done more than 1,500 pickups from the homes of Gardner-White customers, which enables the Salvation Army to keep offering it’s support and rehabilitation services to metro Detroiters in need. The Gardner-White team also does Days of Service with Humble Design and furnishes homes for women and children emerging out of homelessness, partners with Volunteers of America to support veterans and also adopts families during the holiday season, just to name a few ways that Gardner-White plays an active role in our community. To learn more about our charitable programs and see why Gardner-White is so much more than just a furniture store, join our e-mail list and follow us on Facebook.